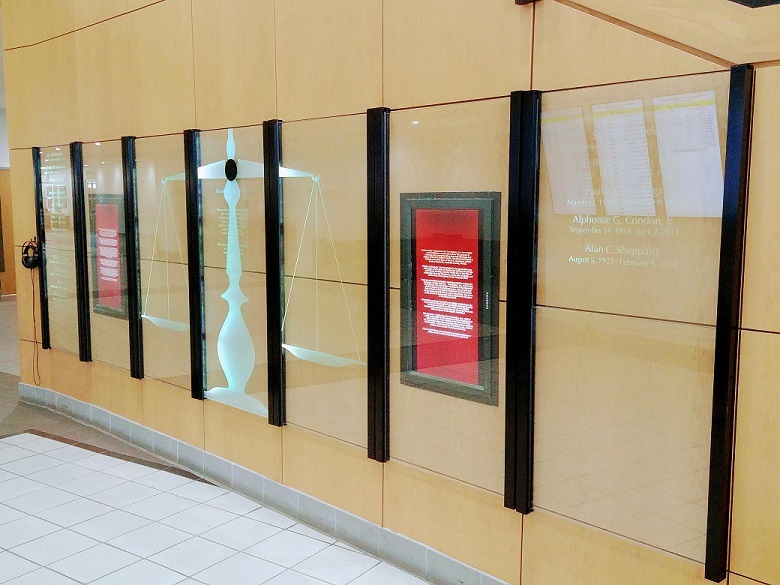 In 2007, The Escambia-Santa Rosa Bar Foundation, Inc. has created and established a memorial wall for the purpose of honoring and commemorating deceased attorneys and judges of the First Judicial Court. The Memorial Display is located on the first floor of the M.C. Blanchard Center, Pensacola, Escambia County, Florida. “Eligible Individuals” shall be limited to deceased attorneys and judges of the State of Florida First Judicial Circuit who are in good standing with the Florida Bar, at the time of the death, and at the time of inscription on the Memorial Wall. Only one memorial per Eligible Individual shall be sold by the Escambia-Santa Rosa Bar Foundation, Inc. at the price of $2500.00. The information contained on the Memorial shall be limited to the full legal name, date of birth and date of death of the eligible Individual and shall remain on the Memorial Wall forever and in perpetuity. The name of the person to be honored will be etched into the glass of the Memorial Wall. Memorials may be purchased by any Eligible Individual or by any person for the benefit of any Eligible Individual either in advance of the death or after death of any Eligible Individual but shall be etched into the memorial Wall only after the death of the Eligible Individual. The Escambia-Santa Rosa Foundation, Inc. shall be solely responsible for the etching and the placement and space selection of the etching on the Memorial Wall. No memorial other than those described and provided by the Escambia-Santa Rosa Bar Foundation, Inc. shall be allowed to be placed in the Memorial Wall.